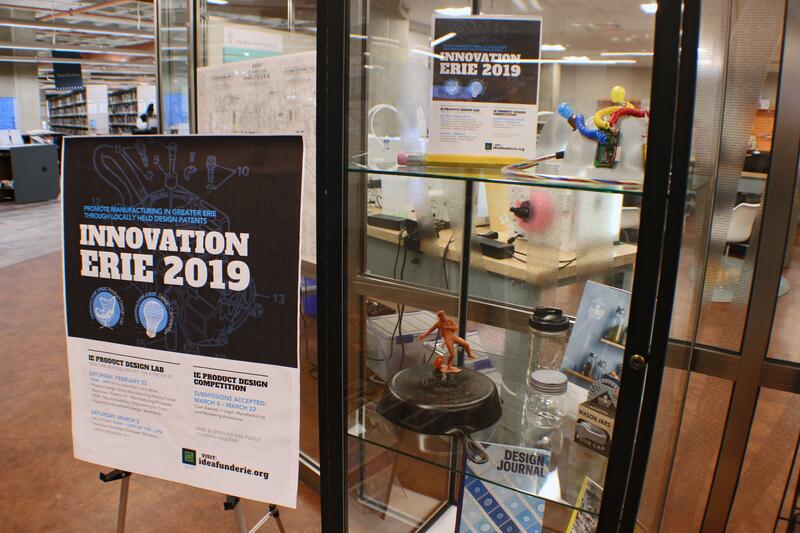 Innovation Erie 2019, a series of competitions and workshops for local entrepreneurs, will be held throughout the spring at the Blasco Memorial Library. It is part of ongoing effort to catalyze Erie's potential. For many years, Erie had an almost unparalleled history in manufacturing. With the proper support and incentives, we could make almost anything. And even with the decline, last year traditional manufacturing still accounted for 22 percent of the local GDP, whereas statewide, those numbers hover around 12 percent. And although we continue to trend toward diversification in the manufacturing and technology industry, our economy now heavily relies on government, healthcare, and education. Today though, there is a motivating awareness that entrepreneurship plays a pivotal role in the future of Erie. This is exemplified through recent developments such as the Innovation District, Ignite Erie, Industry+University Business Acceleration Collaborative, the Idea Lab at the Erie County Public Library, and many others. Coupled with the existing actors, including: Ben Franklin Technology Products, CIVITAS, Innovation Collaborative, ECGRA, the Erie Community Foundation, and other major players — Erie embodies a recipe for future entrepreneurial success. But there is still much work to be done. One of these initiatives in building this entrepreneurial ecosystem was established over a decade ago. The Innovation Erie product design competition was initiated in 2008 by CIVITAS, Edinboro University, Penn State Behrend, the Erie Art Museum, and other stakeholders to solicit submissions of original product ideas that could be manufactured or created in the Erie region, with the possibility of creating new small businesses. Innovation Erie was recently "adopted" by the Idea Fund, and the competition and workshops will be held throughout spring of 2019 at the Erie County Library. One of Innovation Erie's co-founders is Lisa Austin, a professor of art and design at Edinboro university. Known for her efforts to save the McBride Viaduct and the Villa Chapel, Austin views preservation and these efforts as a part of a cohesive response to revitalizing Erie, to building the region's entrepreneurial ecosystem, and to fostering a sustainable economy. Working through the CIVITAS collaborative she co-founded in 2004, Austin has led the establishment of these organizations and others including Preservation Erie, All Aboard Erie, and ErieCPR. Austin embraces projects large and small (including a 2018 run for mayor) in an effort to continue to catalyze Erie's potential. "After growing up in a military family always on the move, my husband and I fell in love with Erie, decided to stay and started paying attention the ways the city was functioning well — or poorly." Over time, and through talking with others, it became clear to Austin that Erie couldn't keep relying on the traditional manufacturing giants like GE, to provide jobs. "While there are still a lot of industries physically functioning in Erie, most of what they produce are items through military contracts — or parts of things. All good stuff, but, the benefits of locally-held design patents to retain the profits here in Erie — and the value-added practice of design excellence — can both help strengthen Erie's identity as a proud 'maker city.'" In 2005, Austin went through the county's Erie Ambassador program and joined their economic development committee. "I noticed there was a lot of work done trying to get businesses to move to Erie — but not so much in the way of helping individuals and groups start businesses — or expand existing small businesses." She started to look for opportunities to foster this development. "Through CIVITAS, I called together regional stakeholders to meet at the Plymouth Tavern to create a kind of mini think tank about how to improve Erie." The group of scientists, artists, manufacturers, engineers and designers came up with the name "SAM & ED." While Austin was able to get a robust lineup of participants, SAM & ED didn't have funds or a clear direction. "Mike Yurkewicz, an engineer then on staff at Penn State's now-closed Plastics Technology Center, urged SAM & ED to focus on creating the competition. SAM & ED members Donna Douglass and Dave Bennett supported the idea and John Vanco immediately offered up use of the Erie Art Museum." Soon afterwards she tells me that Dr. Terry Smith, a dean at Edinboro, wrote a grant to fund the Innovation Erie competition and an incubator. Over the past decade, Innovation Erie has helped a dozen new products come to market. As Innovation Erie continued, the region's complete absence of a product or industrial design program became apparent. "Few of the submissions revealed any understanding of the desires of consumers and the value-added potential of aesthetics, ergonomics, and manufacturability." In response, Austin/CIVITAS and Penn State's Greg Dillon established the Made in Erie Design Lab to provide product design education to help catalyze not only the efforts for the competition but the community's manufacturing industry. Over the years the response has been overwhelmingly positive. "We have had some wonderful submissions and some great products have resonated with consumers in Erie and around the world." One of the most notable winners, Karen Rzepecki, described her design process as noticing a problem and trying to solve it. Her ReCAP Mason jar business, began when she won the 2011 Innovation Erie competition with a cap for Mason Jars that permitted her to mix salad dressing and serve from the same Mason Jar. Austin believes that Erie's future success is still "ours to make." The Innovation Erie Competition will start taking submissions online beginning March 4, 2019. In between, individuals are invited to attend the Innovation Erie Design Lab on February 23 (and March 2) at the Blasco Library to meet the Chair of Innovation Erie, Gannon's Dr. Karinna Vernaza, and hear presentations by engineer-designer Devin Roberts, historian Judy Lynch, engineer Greg Dillon and others. The event is free and open to the public. The deadline for applications is March 22, 2019. For more information, go to: www.ideafunderie.org.